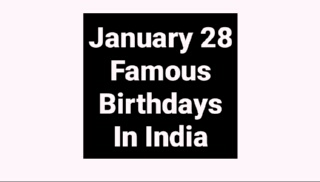 In this post -- Famous Birthdays January 28 Bollywood Actor Actress Cricket Politics, check who are sharing your birthday in India 28 January's famous birthday personality in India like Bollywood actor, actress, cricketer, politician and all famous Indian celebrity. January 28 famous birthdays in India. Lala Lajpat Rai (28 January 1865 – 17 November 1928) was an Indian author, freedom fighter and politician who is chiefly remembered as a leader in the Indian fight for freedom from the British Raj. He was popularly known as Punjab Kesari (Punjabi:The Lion of Punjab) or Sher-e-Punjab (Urdu:The Lion of Punjab) meaning the same and was part of the Lal Bal Pal trio. Vinod Khosla (born 28 January 1955) is an Indian-born American businessman and venture capitalist. Khosla was one of the co-founders of Sun Microsystems, where he served as its first CEO and Chairman in the early 1980s. In 1986, he became a general partner of the venture capital firm Kleiner Perkins Caufield & Byers, where he remained through the early 2000s. Pandit Jasraj (born 28 January 1930) is an Indian classical vocalist. He belongs to the Mewati gharana of Hindustani classical music. Jasraj was born in Hisar, Haryana in an orthodox Brahmin family to Motiram, a classical singer. His family performed the Mewati gharana style. Motiram died when Jasraj was four, on the day he was to be appointed as the state musicians. Raja Ramanna (January 28, 1925 - September 24, 2004), D.Phil., was an Indian nuclear scientist and a prominent physicist, is best known for his leadership directing the research integral for the development of Indian nuclear programme in its early stages. Having started and joined the nuclear programme in 1964, Ramanna worked under Homi Jehangir Bhabha, and later directed this program in 1967. Ashok Chandulal Bhatt was Speaker of the Gujarat Legislative Assembly. He was earlier Minister for Health, Law and Justice for the Government of Gujarat. He entered public life in 1956 through the Mahagujarat Movement and joined the Jansangh in 1960. He was very vocal in favour of banning gutka and other tobacco products altogether in the state. He also took part in NavNirman Movement. Prithipal Singh was an Indian field hockey nicknamed the “King of short corner” by hockey commentators. He participated in the Olympic field hockey three times and each time he scored the highest number of goals as a single player. Singh was a player with sharp reflexes, and the tremendous strength in his long and powerful arms produced firmest and sticking shots. Sir (Herbert) Stanley Reed, KBE (28 January 1872 – 17 January 1969) was a British Conservative Party politician and an important figure in the media of India in the early 20th century. Reed edited The Times of India from 1907 until 1924 and received correspondence from the major figures of India such as Mahatma Gandhi. In all he lived in India for fifty years. He was respected in the United Kingdom.